NIA Charlestown Nevis (April 18, 2018) — The following is a press release from the Ministry of Foreign Affairs in St. Kitts and Nevis dated April 16, 2017, regarding Hon. Mark Brantley’s meeting in London with Lord Tariq Ahmad United Kingdom Minister of State in the UK Foreign Commonwealth Office. The Hon. 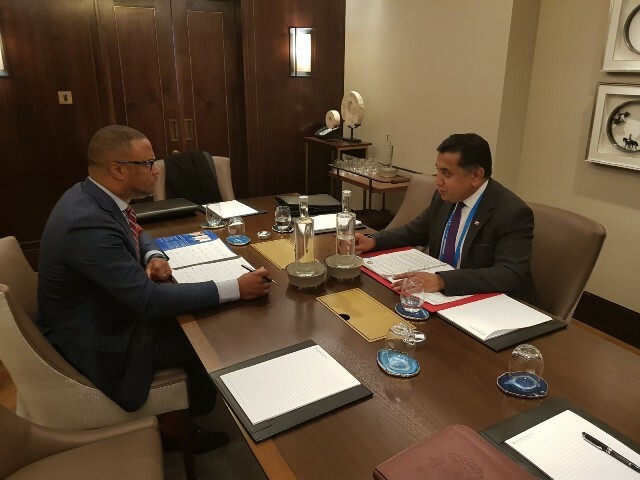 Mark Brantley jump-started his pre-Caribbean Heads of Government Meeting (CHOGM) engagements in London on Monday 16th April 2018, with a bilateral meeting with United Kingdom (UK) Minister of State in the UK Foreign Commonwealth Office Lord Tariq Ahmad who holds responsibility for the Caribbean. The UK Minister welcomed Minister Brantley to the UK and to the CHOGM and expressed delight for the interface. Lord Ahmad, anticipating that the issue of undocumented Caribbean Migrants was of grave concern, assured Minister Brantley that the matter was under active consideration with a desire that it be resolved at the earliest. The UK representative explained that the intent of the British Government was to deepen relations with the region. He expressed enthusiasm about his recent visits to the Caribbean and shared his plan to visit more countries soon. Minister Brantley, welcomed the assurances and thanked the Minister for the UK’s commitment to address this important matter, so critical to many Caribbean families who contributed so much to rebuilding Britain. In addressing the matter of climate change and natural disasters, Lord Ahmad indicated that the UK continues to advocate for and to encourage the international community to mobilise immediate access to financing for countries affected by natural disasters. The St. Kitts and Nevis Foreign Affairs Minister congratulated the UK on its arrangements for CHOGM. He welcomed the UK’s interest in strengthening relations especially in light of our historical ties. Minister Brantley extended an invitation to Lord Ahmad to visit the Federation on his next trip to the region. Foreign Affairs Minister Brantley urged the British Minister to speak to the issues of climate change, de-risking and correspondent banking in international fora where St. Kitts and Nevis does not have a voice. Minister Brantley expressed pleasure at participating in these meetings and lauded the valuable work of the Commonwealth. Minister Brantley was accompanied by Ms. Kaye Bass, Permanent Secretary in the Ministry of Foreign Affairs and Aviation and His Excellency Mr. Kevin Isaac, St. Kitts and Nevis High Commissioner in London.